Give Money and It Shall Be Given Unto You? Before we go on a bit of clarification on the verse is in order. In the King James Version the word mete means “to dispense or allot; to mete something out.” Similar words would be to allocate, assign or dish out. So, if you read this as a stand-alone verse, it would appear Jesus is saying this something odd. Whatever you give (the implication of “give” being money), you’ll automatically get that back. But not only that, you’ll get more back and then some (implied by the terms running over). Just picture a cup that you continually fill. You keep filling it up and eventually it will run up to and over the rim. Put simply, God will give money to you when you give money to Him. Sounds like a good deal to me! Where do I sign up? Fortunately, it doesn’t work that way. God blesses us no doubt. The Bible is clear in so many places about that. But He is not our ATM in the sky. We can’t manipulate God into dispensing out blessings for our own good. 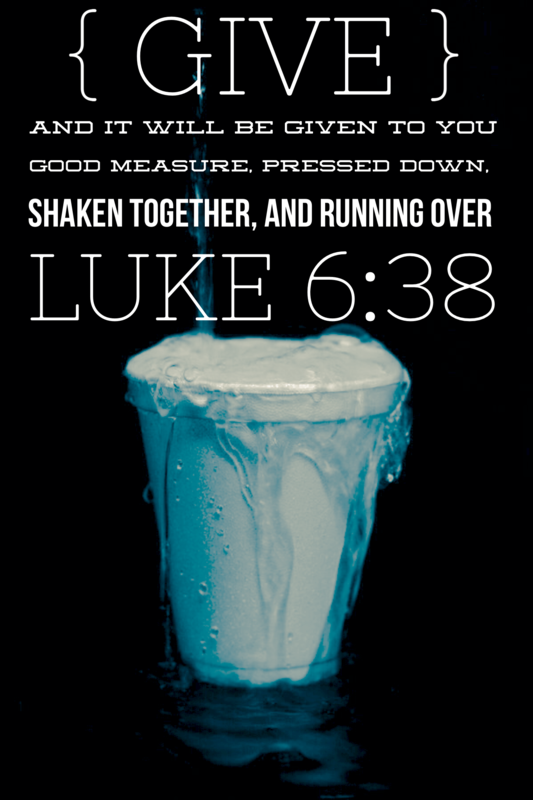 So what does Luke 6:38 really mean? Here is a proper look at the passage. You should always read verses in the Bible in context with the verses around it. You can’t cherry pick a verse here and there and just make it mean what you want it to mean. Context remains the best way to not misinterpret the Bible. In this case, the verses around Luke 6:38 give us a better understanding of the entire discussion Jesus is having. 37“Judge not, and you shall not be judged. Condemn not, and you shall not be condemned. Forgive, and you will be forgiven. 39 And He spoke a parable to them: “Can the blind lead the blind? Will they not both fall into the ditch? 41 And why do you look at the speck in your brother’s eye, but do not perceive the plank in your own eye? It’s interesting. I don’t see money mentioned in this passage at all. Seems like it’s more about judgment and forgiveness and worrying about your own issues (plank in eye) instead of pointing out the faults (speck in eye) of those around you. Luke 6:38 does mention the word give. So that does imply the concept of generosity. Therefore, what are we being generous with if it’s not our money? The whole interpretation of this passage flows out of the “judge not” message of verse 37. Put simply, Jesus is telling us to be generous (gracious) in how we view people. Don’t be quick to judge their motives or intentions. Give them some slack. Forgive them for their actions. Assume the best in people without quickly jumping to conclusions. Think about it. People will not like you if you treat them poorly. If you are quick to give out judgment, condemn others with your words and fail to forgive, you will receive that same treatment back even more. It is a logical conclusion about human behavior. I don’t want to be on the other end of negative treatment. So I think I’ll give generously in these areas as I interact with people. It doesn’t matter how they treat me. Above all, I’ll follow Jesus’ example of loving others and giving them the respect they deserve. What if Luke 6:38 Was About Money? In conclusion, I’d like for you to remove yourself from the interpretative aspects of this verse for a minute and think about it logically? What if Luke 6:38 was really about money? Since I believe the Bible to be true I’d have to take Jesus at his word. If he really meant “give and it shall be given unto you,” he’d be saying, “I will bless you abundantly with money if you give money to me (the church) and other causes that promote my message.” How would that change your strategy for giving? Certainly I would be testing out that theory. I’d probably start with giving something small – say $500 – and see if I’d get that money back somehow. If I did, the next check written to the church would be for more. I might even take out a loan in order to give. And, as a result, when the money continued to pour back to me, the checks “for Jesus” would get larger and larger and I’d get richer and richer. Who is this scenario happening to? I don’t know of anyone. It doesn’t work that way. And I’m glad it doesn’t. That would only reduce giving to a selfish action. My motivation would be to grow my own wealth. I would be looking at what I could get out of giving instead of blessing other people. And I’m sure that’s not what God intended our giving motivations to be. Questions for Discussion: Have you ever heard someone use Luke 6:38 and the phrase “give and it shall be given unto you” as a giving passage? Do you agree with the interpretation I laid out? If not, how do you see it? What motivates you to give? What do you think would become of the world if money always came back to you when you gave? Reading this was a blessing, and also opened my eyes to the context of Luke 6: 38. You do make sense in what you say. The verse is not a formula to making money indeed. On the other hand as one person said, Galatians 6: 7 does say that what a person soweth is what he or she will reap. That, while it is not a formula, seems supported by life’s experiences. A person, even a great one, can commit some terrible thing, then finds himself confronted with it years later. Generosity, it seems has its rewards. Generosity of soul and spirit is of course of the greatest value. That has its returns but it blesses others. I think giving a part of your money has to do with how good you feel about it and how it helps the other person. In our family the single mantra for charity is to give a part of our income to the less unfortunate so that they can have a better life. It helps us stay mentally healthy even as we gorge on multiple Thanksgiving dinners at the mercy of the lord. Loved your thinking in this post, sharing with the wife. Some celebrity ministers take this scripture out of context, write books about it, fill convention centers and teach other out of context scriptures. My response is to pray for them and for curious minds to use biblical discernment. I believe God provides financial blessings within the context of His Word. However, Luke 6:37-38 is not about a financial blessing. It clearly teaches about judging others an forgiving them. Thanks for posting good hermeneutics. “…for curious minds to use biblical discernment.” That’s the ticket right there. When you really begin to read and explore God’s Word, you can better equip yourself to recognize false teaching. Had I not tithed and given over the course of my career I would have, in theory, an extra $2 million in my portfolio of investments. However, in reality I believe by practicing the discipline of giving and giving cheerfully that my attitude toward money and my overall generosity were improved so much that my career went much farther than it would have otherwise. So in a real sense that money came back to me. Although I share your views on this teaching, learning to be a giver does often have financial rewards in life because giving people are more successful than stingy people I believe. Thanks for sharing your experience! Sounds like you’ve had experiences and profited in a way that provides much more personal value than the actual dollars you could have accumulated otherwise. It’s a really good point you make about cultivating a mindset of generosity. Think of what we could do if more people looked outwardly rather than inwardly. thank u so much for new understanding. this has made me learnt more, even yesterday I read this verse in church to motivates member of their giving pattern, but thank god for another eye opening. I really and truly appreciate the time of study that had to come to this revelation. I give God all honor and glory for the things He reveals! I too teach and was extremely grieved as well as humbled that the Lord also revealed this revelation to me. We must study to show ourselves approved unto the Lord, rightly dividing the word of truth, workers who will not be made ashamed. Those who are may not mean too, but woe to those who intentionally lead God’s people astray! Now this is the word (seed) that comes back 30,60,100 not money. this has blessed me greatly even a year later.. be blessed! LUKE 6:38 give and and it shall be given, I have seen allot of preachers use this verse to get a good offering from their congregation ,to me what ever you have plenty of and you see someone that is in need give some of your overflow to that person or persons and GOD will bless your generosity when you are giving from the heart some times it is money and sometimes it is other thins that we have it is possible that it is even your time to someone that just need to talk about their problems sometimes time with that person that is in the hospital it is all giving ,what are we willing to sacrifice. Great post – thanks for writing it. We need more people that seriously consider the context and purpose of Biblical texts. I agree completely with your analysis of what Luke 6:38 does not mean, but please share more of what it does mean, particularly in regards to handling personal finances. Well, that’s just it…I don’t think it does have application to personal finance…except when people take it out of context. I think even though this verse is taken out of context, I think the message is still good — if you give money to others who need it, it won’t be ‘lost’ and you might get back more somehow in the future, although it’s not always in monetary form. Of course, when you give you shouldn’t expect something in return, but rest assured it will give you more blessings in life. I know that scripture can be taken out of context and people at times try to manipulate it to mean what they want it to mean rather than what it actually says and that can be and is very dangerous to that individual and those with whom they share their interpretation without fact-checking it to ensure that it does indeed say that. Can the principle in this verse be applied to other areas of our lives, I think so. I’m learning that there are different types of giving and rules that accompany that giving, as well as the state of the soil of the person, people, or organizations you’re giving to that come into play and affect the results (blessings, returns, protections, etc…) of that giving. I’m not going to pretend to have mastered/figured all of this out as there’s quite a bit that I need to study, pray about and get revelation on before I can speak with any type of authority on it. However, I do believe that the God who multiplied the fish and loaves among the 5,000 and 4,000 is able to multiply our seeds and the store of our seeds when it comes to monetary giving (2nd Corinthians 9:5-13). I totally agree,the person or persons who say God excludes money in the scripture is a liar and the truth isn’t in him,they are full of Greed everything runs off of money in this world,you can spend your money without question in everything else but when it comes to God and the church there’s a problem,why is that. I agree with you Brian. There are lots of verses in the bible that seem to be misleading and context is the solution to get the real meaning and for us to infer it. So, we’d better read it between the lines. This is a verse that seems to be almost always taken out of context. I do believe that God does bless those that give, but I don’t think it’s necessarily related to this verse. “…God does bless those that give…” I agree Brian…I think that can be proved in other places of the Bible but not here. And most times the blessings that come are in the heart, not the wallet. I’ve heard this verse taken out of context often! I’ve been discovering lately that reading passages in context and considering the author’s purpose completely obliterates improper reading. Thanks for the reminder. “…reading passages in context…” It’s probably the biggest factor to truly understanding the Bible. Anyone can rip one verse out of the Bible and make it mean what they want it to. More difficult to do when taken in context with the surrounding verse. The thought that this verse may not be about money at all is a new one to me. But it seems like a reasonable explanation given the context. I appreciate the new perspective. The interpretation I have heard most often is a combination of the two you present. You should be charitable (with your money, time, etc.) and expect blessings in return, but that those blessings won’t necessarily come back in monetary form. Giving is an act of love, compassion, and obedience, not an investment strategy. “Giving is…not an investment strategy.” That’s gold! You should patent that saying. Wow. “Giving is an act of love, compassion, and obedience, not an investment strategy”. That’s a compelling rendition! Thanks for this Brian – so many verses are taken out of context – “an eye for an eye”, “the rich rule over the poor”… your commentary is pretty timely especially with so many “preaching” prosperity. “…with so many “preaching” prosperity.” Sadly, that is where you’ll hear this taken out of context the most…in the pulpit at churches. Too bad because some people are blindly giving to the church and don’t have enough money to pay their bills. The scripture that says whatsoever a man soweth that shall he also reap! What so ever it is, whether it be money, forgiveness, love, kindness etc etc whatever you sow you will reap! You reap good when you sow good! And Malachi speaking about tithe, God said he would open up the windows of heaven and pour you out a blessing you couldn’t contain! In that same verse God said prove me! I don’t believe God will ever asked us to give what we do not have to give, but when he blesses us financially we should bless others who are in need and we should bless our church to carry on God’s work!